Premier’s Active April encourages all Victorians to do 30 minutes of physical activity a day during April. It’s free and it’s part of the Victorian Government’s commitment to get more people to keep moving and be more active. Start small – remember every little bit counts. It’s an easy way to kick start a healthier you! This year the all-new Get Active Workout Videos will be available to help you keep active everyday this April. With 30 workouts to choose from, it’s like having your own personal trainer whenever and wherever you like! We also have a new Activity Timer and Tracker to make it easier than ever for you to track your workouts and log your activity throughout the month. Plus My Local to discover local offers, events and facilities available throughout Victoria. a range of benefits, prizes and resources for early learning centres, schools and workplaces participating in Active April. *Terms and conditions for all prizes and offers apply. Visit activeapril.vic.gov.au for details. We’re celebrating everyday women being active, regardless of background, ability, age or body shape. So many of us worry about being judged for our appearance or ability when we work out. Why should we let it stop us from getting involved and staying healthy? We’re banding together to say ‘this girl can’ take her health and happiness back into her own hands. It doesn’t matter if you’re a newbie or a regular, how red and sweaty your face gets, or even if you don’t know all the rules; all that matters is you’re giving it a go. 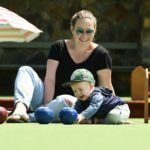 One way we are doing this in north east Victoria is by supporting the Rutherglen Bowling Club deliver the Bowling with Babies initiative from Bowls Victoria. It’s a great way to make friends while getting active in a comfortable and encouraging environment. Over the summer we are teaming up with Rural City of Wangaratta, Wangaratta Croquet Club, Wangaratta Traditional Karate Do Goju-Kai and Wangaratta Ultimate to deliver fun and flexible physical activity offerings to local women of all ages and abilities. Stay tuned for more details about how you can be involved. For more information on This Girl Can – Victoria, visit their website.